This title was first published in 2001. 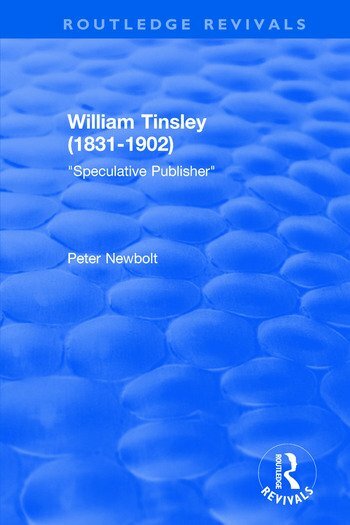 An account of the activities of 19th-century publisher William Tinsley, particularly in relation to his authors and his chosen way of making a living. In considering the library-publishing system that dominated all aspects of fiction in the latter part of the 19th century, when down-payments rather than loyalties were the rewards of novelists, it may be surprising to find how wide were the variations in prices that publishers paid for such work. Differences appeared when individual publishers developed soft spots for particular authors, and in consequence they sometimes made fools of themselves. William Tinsley certainly did so, on several occasions, but was blessed, at least in later life, with the grace of never seriously regretting any of his mistakes. Examples of the nature of this good-hearted man are found in these pages. This account relies to an extent on Tinsley's two volumes of memoirs.